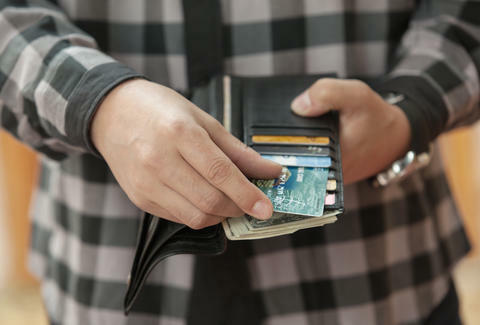 When you live in New York, money just vanishes from your wallet. You could be walking home from work with $100 in your wallet and not have a cent left by the time you reach your door. It’s just the way it is here, and we all know that. What we don’t always know is where the hell that money goes, due to this Houdini-like ability to disappear into thin air. Plus, are we even really saving money when we think we’re saving money? I decided to get to the bottom of it by pricing out the average costs for some of the biggest things New Yorkers spend money on (aside from, you know, rent) and then comparing those to their money-saving counterparts. All average costs were based on real statements from my credit card over several months. Some of these findings were actually surprising, except for one: we spend a LOT of money on food and alcohol. If I could deduct monetary value based on the sheer bliss I feel when my food arrives without having to do a damn thing except pause Making a Murderer, I would. But this is about money, and my go-to Seamless orders (including tip) usually dance around the $20 mark. Don’t judge, I need the extra sauces, OK? Here’s the thing about grocery shopping just for dinner, that rarely happens. Of course we buy other things that have nothing to do with the dinner at hand. And even the things that do are likely superfluous -- do I really need more Old Bay seasoning? (Yes.) The trick to really saving here is going in with a game plan for a quick and simple dinner, in which case you can walk out for under $20. But wait, the Seamless number is lower! Yes, it is, but it still doesn’t win -- here’s why: cooking, more often than not, yields more leftovers and/or items you can use way past the expiration date on your Chinese food delivery. So the average cost (per meal) is actually lower when you cook dinner. Staying on the same side of town (in this case, the east side) makes any cab ride extensively cheaper. This ride was a fast cruise down Lexington, and the fare was just over $5 before tip. The cost increase for me to whip out my app and have the cushy Nissan Altima waiting for me upfront was pretty minimal, and even less if you deduct $1 for the bottled water I took from the backseat. The 6 train door to door, if you hit it right when it arrives (so, never) is a quick ride, but the prices -- and smells -- are increasing in this mode of transportation. Thanks to these increasing MTA prices, a cab ride home is not too far from the cost of a subway ride. 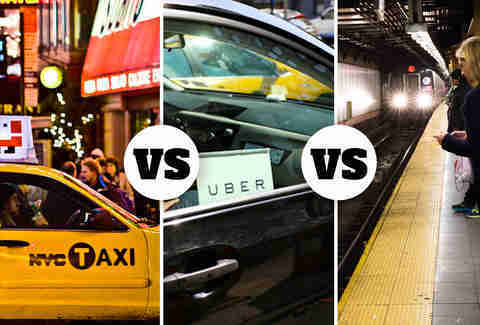 But when it comes to round-trip cost, they still have the market cornered on cheapest transport. Also, if your cab or Uber ride is ever $2.75 one-way, remember, walking is free. This particular cost is based on five drinks, a shot, plus tips at a mid-range, East Village bar (fine, it was HiFi). Obviously this varies greatly on where you go out, how many bars you hit, etc., so if anything, I’m being slightly modest with this one. *Price does not include the drinks you definitely forgot you bought with cash. If I’m staying in, particularly on a weekend night, I’m ordering Seamless (see “Battle 1”), and chances are I order even more than usual because I have lots of movies to get through. Speaking of movies, Time Warner has a $4.99 rental fee for new releases (Trainwreck did just become available On Demand! ), so that’s also factored into this cost. Even if you go on a new release rampage, it will never come close to the financial whirlwind that is a night out in New York. Not to mention, the undisclosed costs to your emotional, hungover state. Get ready to hate me: I have a washer/dryer. It’s fantastic, sorry. And while detergent is actually pretty expensive, it lasts for nearly a month. 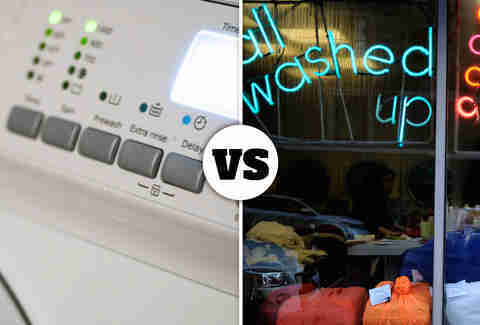 If you go to a laundromat, it’s typically around $2.50 for a machine in addition to that detergent cost. There are three things that are cheap in New York: pizza, cart coffee, and sending your laundry out. Before my glorious washer/dryer days, I used to get 10lbs of laundry washed, dried, folded and delivered back to me for less than $15. And admittedly, I did laundry much less frequently when I had to send it out. Bringing your lunch seems like a fantastic idea in theory. You get all your groceries together on Sunday, you even make those Mason jar salads you saw on Pinterest! You’re doing this. But to make those for the week, it will cost you upwards of $60 at the grocery store. And then there’s the sadness you feel when you actually go to your work’s communal refrigerator to retrieve your pre-made lunch. 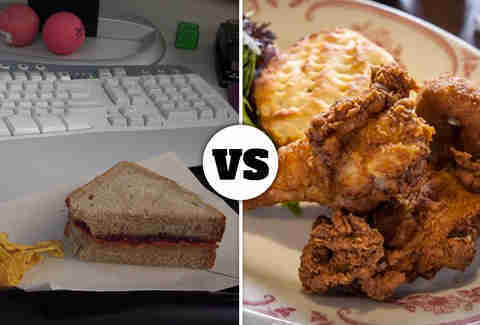 Eating lunch out is indeed one of the more financial slippery slopes, as it can really add up. Especially if you want to keep it on the healthier side. If you don’t, well, consider this always the cheaper option because dollar slices and Halal carts are everywhere. Before you claim me a fool, let me break down the math: yes, the daily spend is technically less when you bring your lunch, but the finances don’t lie: you inevitably spend and waste more from the weekly grocery shop to prepare these meals. 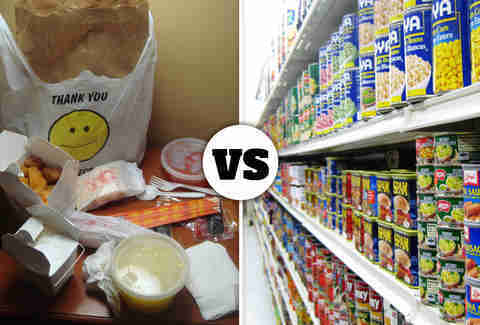 The sad truth is, eating healthy is more expensive (right, American obesity? ), so when you stock up on veggies and fresh meats to bring to work all week, they’re usually kaput before the week’s end, meaning by day four you’re back to $13 Sweetgreen salads. So basically, it’s like you spent double. Liz Newman is a Freelance Writer for Thrillist, and despite this very telling (and slightly depressing) research, she doesn’t plan to discontinue her pho delivery any time soon. Follow her to her financial downfall on Twitter and Instagram at @lizn813.